I reckon that 2011 is out to break the record for the number of puzzles by debut setters. Unfortunately, somebody is going to have to trawl through twenty years of puzzles to see what the current record is! Any takers? So what does debut setter Ilver have in store for us with Easy Win? Across clues are fairly straightforward, but down clues contain an anagram of the entry with an extra letter which must be removed. These letters would need arranging to give something that would help solve the eight unclued entries around the perimeter. The anagram-and-extra-letter device was used only the previous weekend by Ploy in his EV puzzle Mix-up. It struck me as unusual then, and here we are with something similar only a week later! A recent Crossword Club message board thread asked a question about how solvers tackle puzzles. 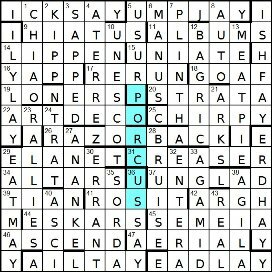 As you probably know by now, I go through the acrosses then downs in order, hoping that some answers will be easy enough for me to get without much effort. The only thing to which I have given thought is how long to spend on each clue during this phase. It tends to be about 20 or 30 seconds, and perhaps that explains why I sometimes only end up with eight or ten words in the grid. So how many this week? Well, a fair few as it turned out: 9 HIATUS, 16 YAPP, 17 RERUN and half a dozen more. These included 20 Nazi militia contains prostitute moving right to left identifying levels of society, for which I initially entered STRATS (which doesn’t even exist) instead of STRATA, but much as I tried, the mental image I got from the surface reading didn’t really gel. However, 31 Ironing lady, perhaps, is questionable second career for CREASER, and the simple 39 Dish ain’t cooked, TINA, were spot on! The down clues didn’t yield quite as many, but within 30 minutes, half the grid was filled. It was only at this point that I noticed the level of unching in the grid. Even taking into account the unclued entries in the perimeter, it was very low. This probably helped explain why I finished the grid (except for the unclued entries) in less than 90 minutes. That included solving the across answer that was without definition, and which I suspected all along would be the entry in the central row: RAZOR (precise) BACK (in reply). Now was this going to represent a whale or a pig? I’m sure that a lot of you spotted the many As and AYs in the perimeter and got the theme before deciphering the extra letters, but not this solver. The extra letters to be exluded from the anagrams in the down clues turned out to be PLAITING, but I didn’t spend too long wondering how this was relevant since we were told by the preamble that the letters would need arranging. I doodled them next to my grid as LAPITING, and it took about ten seconds for me to see that PIG was there; crossing out those letters, LATIN remained! I was lucky that my doodle provided the letters to be arranged in their correct sequence, as indeed the original PLAITING also had them! Luckily I was told about Pig Latin about forty years ago (thanks, Terry). It involves speaking in a sort of code whereby you move the first consonant(s) in a word to the end with -AY added after. Thus, LISTENER becomes ISTENERLAY and CROSSWORD becomes OSSWORDCRAY. I believe there are some slight variations to the exact method used. And thus I saw the perimeter entries as pig Latin forms of words that could be prefixed with PIG: SICK, JUMP, TAIL and LEAD for the acrosses, and FISH, LILY, HERD and MEAT for the downs. Finally, there was an entry to be found that could be pig Latinised to reveal a thematic word. At first I thought this might be UNGLAD at 37ac which could become UNGLAY for LUNG. Luckily there’s no such thing as ‘pig lung’. 36dn looked more promising, ESSAY, and I confess that it took me longer than it should have for me to try realise that SUS (with just one S) would become USSAY, and complete PORCUS in the central column. Crossing that in row 6 was COCH, and I wondered if Ilver had been toying with COCHON (French for pig) as a red herring. Another good puzzle from a debut setter, and thanks to Ilver for a reminder of something I heard in about 1970. Oh yes, and the title is an anagram of Inesway (pig Latin for ‘swine’), and the title of this blog refers to the change in prizes for the Listener starting with this puzzle, although I suspect that most of us will already have invested in the 12th edition of Chambers by the time we get drawn out of the hat! This entry was posted on 21 October 2011 at 4:00 pm	and is filed under Solving Blogs. You can follow any responses to this entry through the RSS 2.0 feed. You can leave a response, or trackback from your own site. The Listener goes back a bit further than twenty years Dave with the series starting in 1930. 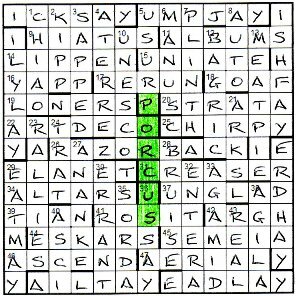 However, the early puzzles were mostly supplied by very few setters, starting with Doggerel and Janus, and there were also a number of puzzles with no pseudonym given. I have had a very quick scan through the setters on the Listener site and the number of debuts increased rapidly from the early forties and especially into the fifties – I counted 13 debuts in 1953 alone. There was a bit of a slump in the early seventies but they picked up again in the eighties and to the present day.